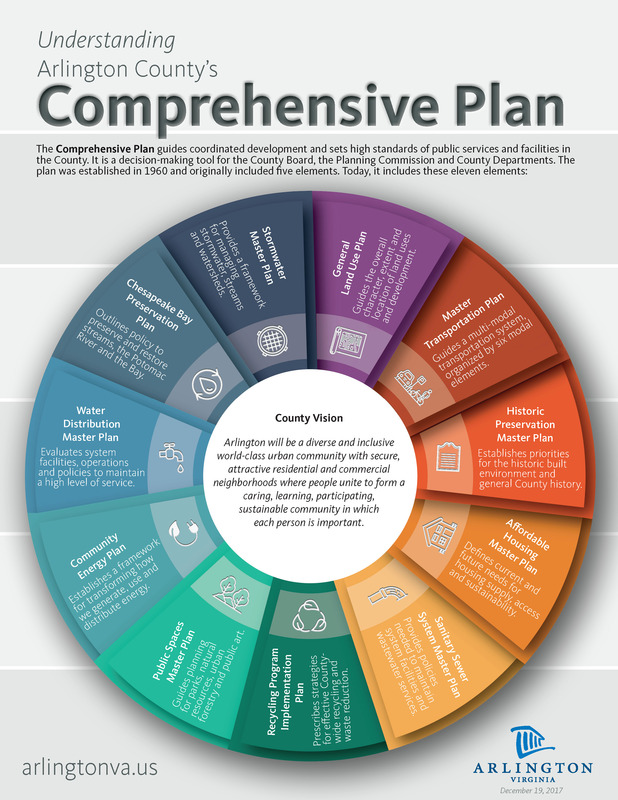 The Comprehensive Plan is one of the most important decision-making and priority-setting tools that is used by the County Board, Planning Commission and County Departments. The document guides coordinated development and sets high standards of public services and facilities in the County. Achieving Arlington’s vision is at the core of this plan. The plan was established on August 27, 1960, and originally included five elements. The document has been amended over time and now includes eleven elements that touch on a wide-ranging set of community needs, including: land use, transportation networks, transportation modes, parking, historic preservation, affordable housing, sanitary sewer system, recycling, public spaces, natural resources, urban forestry, public art, community energy, water distribution, Chesapeake Bay preservation, and stormwater management. Quick Reference to Arlington’s Comprehensive Plan: a one-page, at-a-glance look at the most basic information. Essential Guide to Arlington’s Comprehensive Plan: a short, easy-to-read booklet that explains how the plan works and summarizes each element. Technical Resource to Arlington’s Comprehensive Plan: a thorough, detailed look at each element’s goals and objectives, all assembled in one place.